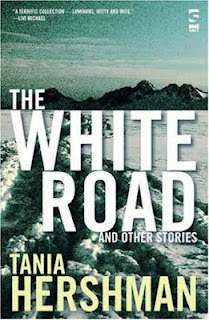 Book Review: Tania Hershman's "The White Road and Other Stories"
Home » books » review » short story » Book Review: Tania Hershman's "The White Road and Other Stories"
I don't read short story collections very often. If you ask me, I couldn't really tell you why. Perhaps I prefer the literary sustenance of a full-length novel. Well, if literary sustenance is what you're looking for, look no further than Tania Hershman's wonderful short stories. It's difficult to give a synopsis of a short story collection, and what would be the point? Much of the work in this collection is inspired by articles in New Scientist magazine. These stories explore the lives of a range of enticingly believable characters, with a plethora of approaches to match. Whether it's the woman who discovers she can't conceive, the man who was struck by lightning, or the man who knows the secret to looking youthful, Hershman's characters are vivid and real. From the opening pages, I couldn't stop reading. Each story pulls you in with its meticulous detail. While Hershman creates fantastic plots and imaginative inventions (the machine that can destroy rain clouds or the sinister tracking devices being planted in clothes), she also has an extraordinary ability to convey deeply meaningful and profound moments in the same way poetry does..
At times it felt like reading the best of Alan Lightman. The best thing about reading The White Road and Other Stories, is that it really made me reassess how I view the short story. I can now see its potential as a great literary form that is able to capture the tiny moments of everyday experience in a way that it's difficult to do with novels. These are vignettes, moments, and if the writer is a competent as Hershman, they can be extraordinarily beautiful. Look out for Hershman's new collection: My Mother Was An Upright Piano: Fictions. I can't wait to get my hands on it! I thoroughly enjoyed The White Road and your review has captured it brilliantly, reminding me of why I liked it so much! A terrific post.